The White Mountain® brand began in 1978 in Lisbon, New Hampshire as a small domestic footwear factory specializing in ladies footwear. It has since grown nationally as a provider to women across the United States. White Mountain's factory location in the rural New Hampshire White Mountains became the source of the brand's name and image. After 26 years in the footwear industry, White Mountain has since developed an office in Wellesley, Massachusetts while still maintaining a home office and distribution center in Lisbon. By combining fashion and comfort White Mountain has been able to create collections for the busy woman. White Mountain shoes create the freshest looks of the season at the best prices, so you no longer have to settle for last years fashion with White Mountain footwear. No matter the season, they seek to keep you up-to-date with the latest trends of the season. White Mountain is unwilling to accept that a woman must make a choice between beautiful and comfortable shoes. Their commitment to "making your feet happy" is greater than ever and they hope you will share their vision and proudly wear White Mountain shoes. Just remember your White Mountain kicks will be stylin' while your wallet won´t be cryin'! Come on, scale the mountain, you'll look great at the top!! I love the way these shoes look, but unfortunately you can tell they're not made of the best quality material. They 'squeak' when you walk, every step makes noise which is incredibly annoying. The front of the shoe scuffs up pretty easily. They're also not that warm. The heel also feels like it's awkwardly placed so some steps feel a bit weird, like you're not truly centered on the shoe. Overall, they're just kind of "eh". 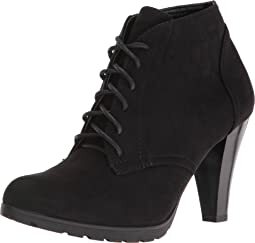 I have been looking for a shoe like this that does not have a tall heel. The small front platform makes the shoe more comfortable to walk a lot in. Material itself is stiffer than expected. I wear an 8 or 8.5 depending on the brand; I ordered both and kept the 8.5. The height of the shaft covers the ankles, which doesn't rub, etc. when walking. Though if I could design the shoe, I would lower the shaft slightly (1-2 cm) for a more delicate look. Much like a previous review, I have the exact bootie I bought at DSW. They have been a favorite for at least two years. The style, the comfort, the fexibilty to dress them up or down. When I saw them on sale, I had to get another pair, I've just about worn out mine. I was sadly disappointed in the quality. They are not suede and very stiff, not to mention I could barely put my foot in it. My old pair are 10s and they fit perfectly and that's the largest available. I will be returning them. 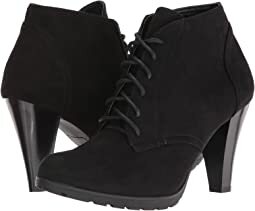 I own a pair of WM boots and wanted another pair of booties so badly but, unfortunately this pair was just inadequate mainly because they are not leather/suede so they don't "give". I also found them a bit too narrow and I have a medium foot. I loved the style in the photos and was hoping they would be comfortable but was disappointed. Zappos made shopping and returning easy so, I was grateful I got to try them. Hopefully, better luck next time. 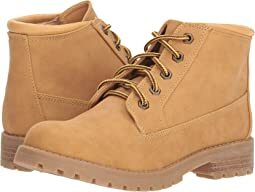 I bought this exact shoe (White Mountain-Serving) 4 years ago at TJ Maxx and loved them. So comfortable and true to size but have worn them out and wanted another pair. They were a soft leather upper suede. This shoe that came was not leather upper but man-made and stiff. It also was too small, between 1/2-1 size difference. Although the shoe looked good I was really dissappointed in the quality difference and the fit.